This unstitched textile length, a pure cotton fabric in eye soothing cream tint, lustrous zari border and end-bands, a component of male ensemble ‘dhoti’ is one of earliest classes of textiles in use since at least the Mauryan era – fourth-third century BCE. Besides its luxurious look and all its magic revealing in its sheen, this style of ensemble emits some kind of ritual sanctity. 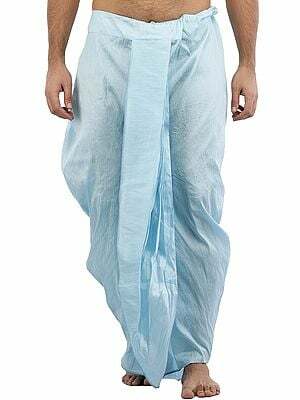 A priest’s wear an unstitched length of textile that a dhoti essentially is since the Indus days a dhoti is a ritual garment, no rite accomplished unless its performer is in dhoti. In South Indian shrines, to include those in Kerala as also Andhra, only one wearing a dhoti is allowed entry. This dhoti with fine zari work is typical of South Indian temple goers. The zari is synthetic; however, with its rare finish and fibre’s fine quality it has the beauty and elegance of pure gold wire. Forbes Watson, in his book published in 1866 defined Indian costume as 'leave the loom' and are 'ready for wear'. The same as Alberuni, an eleventh century scholar from Central Asia, who was in India from 1017 to 1030 A D, had observed that Indian natives used 'turbans for trousers'. 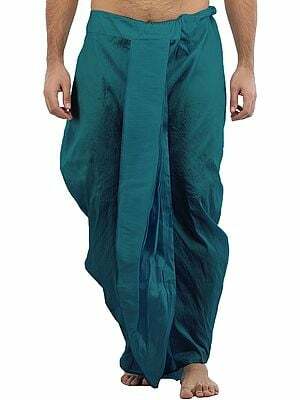 Both referred to a dhoti, a simple unstitched length of textile that at times could be laid over the shoulder as an ‘anga-vastram’, and at times, as turban. Alike, this piece of textile, though manufactured as dhoti, is often seen worn also on shoulders. As suggests the steatite figure of the famous Indus priest wearing a textile length down to his waist, and another, on his shoulder, the cult of adorning a textile length with various design-patterns has persisted ever since. This dhoti seeks to adorn it in brilliant zari. 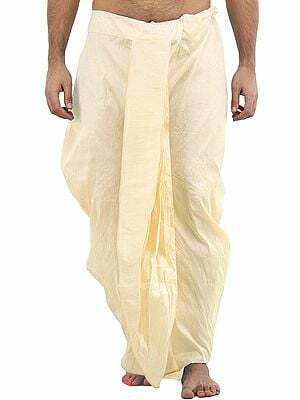 This dhoti, a four meters unstitched length as are invariably the dimensions of a dhoti, is woven from fine pure cotton in soft cream tint and defined with brilliant zari with gold like lustre. A class of textile getting obsolete except in rural belt, among nobility and priestly class a dhoti is a ritual ensemble now for ages. Craving for novelty and to look different in a marriage or when celebrating a festival urbanized youth of society’s upper strata are also seen wearing a richly crafted dhoti. Even in a large crowd a dhoti has phenomenal presence.